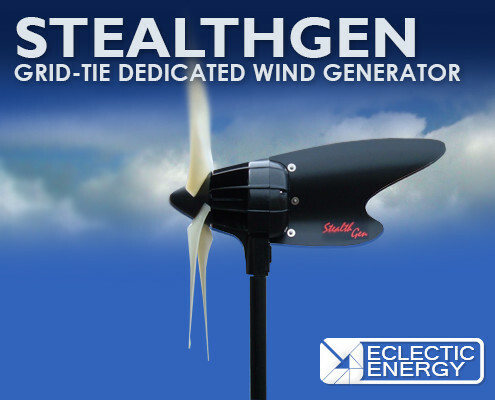 The StealthGen Wind Generator is a new direct-drive wind generator, designed for a variety of microgeneration applications. It is exceptionally quiet and vibration-free in operation, qualities that are of paramount importance for any wind generator operating in close proximity to people. The StealthGen features a powerful 3-phase alternator, and computer-designed rotor blades optimised for low speed, user-friendly operation. This innovative machine is extremely efficient in low wind speeds, yet is capable of sustained power outputs of over 500 watts in higher winds. It is small and light enough to be easily attached to most building structures. 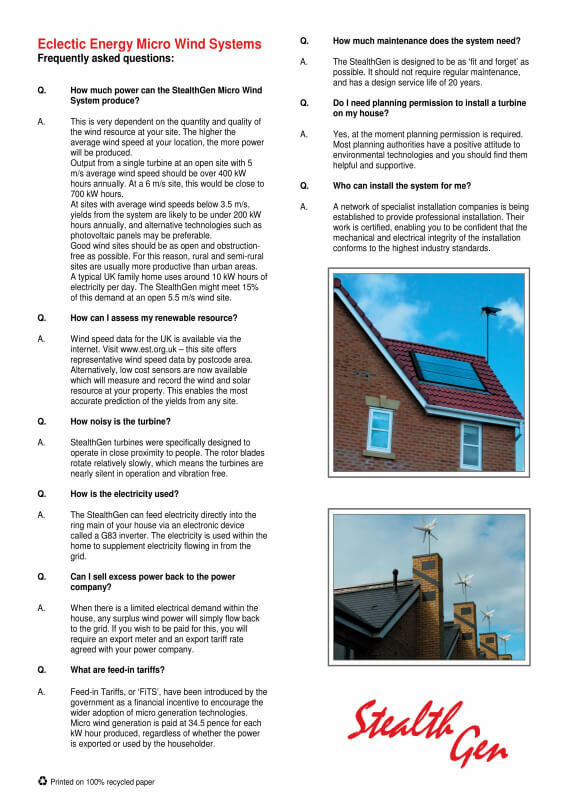 Given average wind speeds at the site of around 12 mph, one D400 StealthGen could realistically provide 15 – 20% of the average home’s annual electricity requirement. Inexpensive to purchase and virtually silent in operation, once installed the StealthGen is no more conspicuous than a satellite dish. Distinctive and elegant in design, the StealthGen is superbly engineered for long, trouble-free service, and is available in 12, 24, 48,72 or 150 volt grid-connect variant. Due to the StealthGen’s low cost, it is perfectly feasible to install several machines. 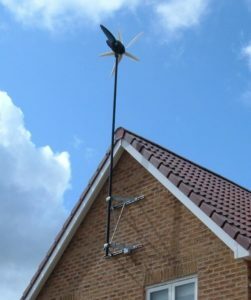 Small wind turbines sited within the urban environment have the potential to make a significant contribution to the attainment of fuel poverty and carbon abatement targets. Eclectic Energy Limited has worked closely with INREB Faraday, the NGO tasked with the development of these technologies. Conventional wisdom has largely precluded the mounting of wind generators on buildings due to the unacceptable noise and vibration associated with such installations. Eclectic and its research partners have overcome these problems in the development of the D400 and StealthGen technology. 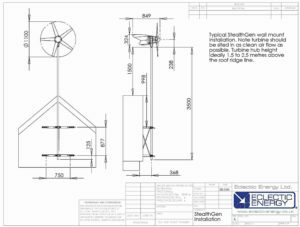 Eclectic StealthGen turbines can be successfully mounted off structural walls (typically the gable wall) using the specially designed bracketry illustrated. Drawing A (and photograph Aa) shows a typical standard duty installation, secured by 4 x M10 masonry anchors, and provides for a maximum free tower length of 2.5 metres. Refer to ‘Standard Bracket Installation’ section. Where a greater free tower length is required, i.e. 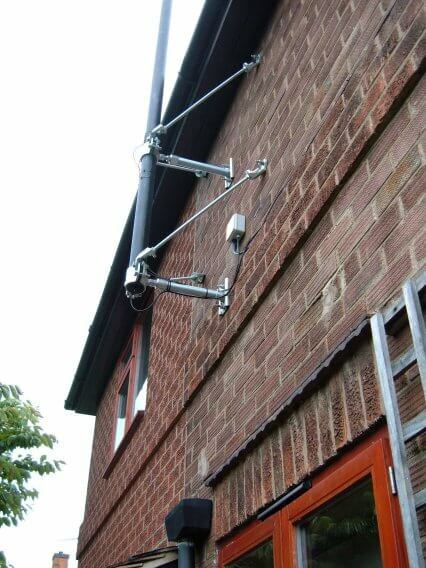 up to 4.5 metres, the heavy duty bracket system (see photograph B) should be used. These brackets are secured with 8 x M12 masonry anchors, and can accommodate towers up to 75mm diameter. The masonry anchors used should be of the pumped resin grout type, and fixings should be subject to a proof load test prior to the bracket installation (photograph ‘C ‘). This testing demonstrates that fixings and masonry are sufficiently strong to absorb the loading produced by the turbine. 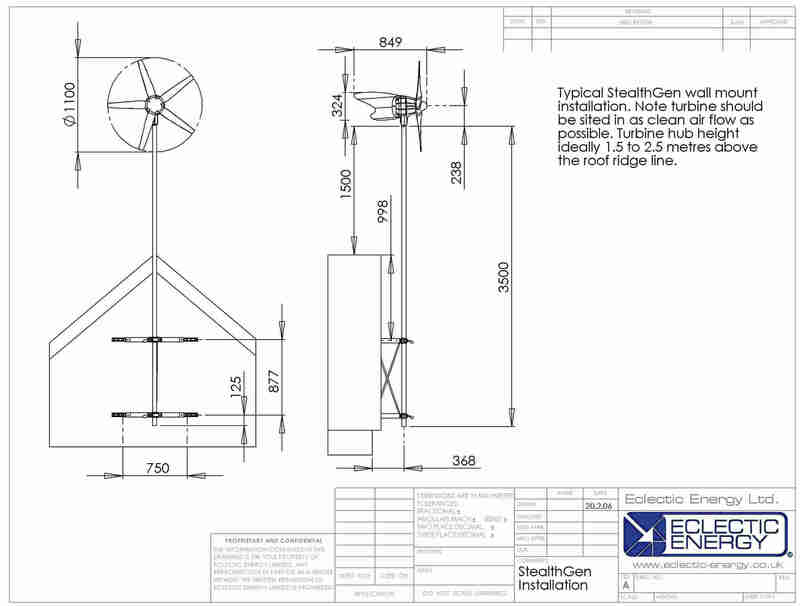 Note, any StealthGen mounting tower should be designed to provide a safe working load of 70 kg in a lateral direction at the hub height of the turbine. bracketry illustrated. Drawing A (and photograph Aa) shows a typical standard duty installation, secured by 4 x M10 masonry anchors, and provides for a maximum free tower length of 2.5 metres. Refer to ‘Standard Bracket Installation’ section.